The Old Town Trolley operates in seven U.S. cities, offering a unique and lively way to see each town, here San Diego. place to "hop off" and take a stroll, shop or find a fun restaurant. The historic Hotel Del Coronado is on the trolley route. and lively place to stop. STEP ABOARD the Old Town Trolley in seven U.S. cities and be entertained in a leisurely way as you play tourist and learn something new about the town. Located in Boston, Key West, Washington D.C., St. Augustine, Savannah, San Diego and Nashville, the trolley takes pride in showing off each city to its best advantage, exploring the historic sights and famous landmarks as well as charming hidden corners that might not be well known. Its hop on-hop off feature is a huge draw, allowing passengers to exit for lunch or a snack, shopping or a museum, or simply to stretch, wander and learn. (Cookie) Meyers, Julia Ratliff and her mother, Pam. at a favorite restaurant. 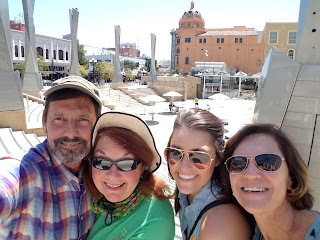 We strolled and stretched near our beautiful Horton Plaza, in which one of our favorite venues, the Lyceum Theatre, presents award-winning drama by San Diego Repertory Theatre. We loved showing off the theater and plaza to our pals, Pam and Julia Ratliff, who share our connection to Stillwater County in Montana. After our leisurely lunch, we waited only five minutes for the next trolley. Stops are frequent so you can time your strolling, museum visit or meal and never have to wait long. Trolleys arrive every half hour or less. A trip through Barrio Logan gave us a look at delightful art. BALBOA PARK is also a fine place to "hop off" -- with wonderful museums, fountains, gardens and strolling paths. One could easily spend a day in Balboa Park alone. Each city has its parks, monuments and historic points, a lively nightlife and restaurant area -- in San Diego, Little Italy looked so inviting our friends returned there for dinner before heading to Coronado where they were based. The Star of India is the show piece of the San Diego Maritime Museum. If you are visiting one of the Old Town Trolley cities, your trip on the trolley will be greatly enhanced if you ride with a local person. The driver-guides we had were great but having native son Keller with us really enhanced the day. His asides were enriching -- about the harbor, Maritime Museum and Star of India, Horton Plaza, the restaurants and sports complexes, his childhood haunts (he was born in San Diego) and more. He described our Hispanic neighborhood, Barrio Logan, as "a blossoming artistic, industrial area with Mexican roots." At its heart is Chicano Park, with murals depicting the community’s activism, and famous Hispanic figures such as artist Frida Kahlo. Families are welcome on the trolleys. Warehouses have been converted to inviting galleries, taco shops and breweries. At the harbor, the Maritime Museum houses a submarine and vintage ships including the Star of India. if you have a particular question or interest. ANOTHER PLUS of the Trolley tour is a booklet of free attractions. Father," displaying his title character's range of emotions. in San Diego, and known throughout the western world. UP NEXT: We take you to the beloved Hotel del Coronado, across the Coronado Bridge in San Diego. Home to movie stars, the wealthy, and setting for several movies, including "Some Like It Hot," with Marilyn Monroe, "the Del" has aged like a graceful matron. When built, she was the largest resort hotel in the world, made entirely of wood. She's survived and thrived and we share her lively history. Remember to explore, learn and live and catch us Fridays for a fresh look at travel, the arts, nature and whatever else strikes our fancy. Delightful read.....had no idea we had this wonderful diversion, having just moved from Chicago. And the play sounds magnifiicent --thanks for the varied post. We read the trolley piece and printed it out for our visiting New England cousins who have not been here in 25 years. Love the "hop on" element. They are playgoers so we booked the 4 of us next weekend for "The Father." Sounds poignant and well done. Thank you for consistent fun recommendations. Savanah's trolley is fun, too. Thanks for plugging them all. We look forward to the Hotel Del piece. Have stayed many times through the years....fun column. Great photos and variety.